SANYA, Hainan, April 13 (Xinhua) -- Chinese President Hu Jintao met his Russian counterpart Dmitry Medvedev Wednesday in the southern Chinese beach resort of Sanya and the two leaders agreed to further improve cooperation and safeguard common interests. During their meeting before the BRICS summit slated for Thursday, Hu outlined four major aspects that the two countries could work on to promote relations. -- Seize the opportunity of the 10th anniversary of the signing of the China-Russia Treaty of Good-neighborliness, Friendship and Cooperation to carry forward and consolidate the traditional China-Russia friendship. -- Enhance mutual political support and firmly back each other's efforts in safeguarding national sovereignty, security and interests. -- Push forward cooperation on major energy projects like the west natural gas pipeline from West Siberia to China and expand all-round cooperation in sectors such as economy and trade, investment, advanced technologies, finance and culture. -- Strengthen communication and coordination on international and regional issues as well as major issues such as the global economic and financial system reform. Medvedev agreed with Hu's opinions, saying that Russia is willing to work with China to push the bilateral cooperation to a new level. Medvedev said that the two countries should improve high-level exchanges and political dialogue and have in-depth discussions on bilateral issues as well as major international and regional issues of common concern. Medvedev said the two sides should further expand trade and promote cooperation on investment and major areas such as oil, natural gas, hydro-power and nuclear. He also said that the planning for the cooperation between northeast China and Russia's far east and Siberian areas should be well implemented. The two countries should also enhance coordination and cooperation on international issues and within the G20 and other multi-lateral mechanisms, he said. 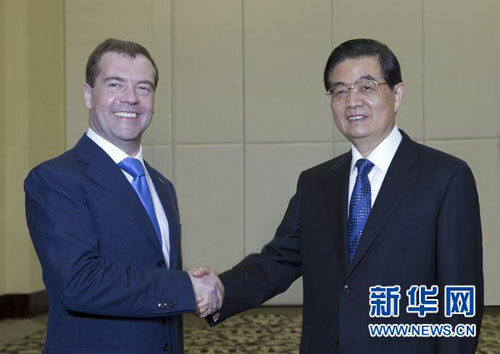 Hu and Medvedev are meeting on the sidelines of the BRICS Leaders Meeting scheduled for Thursday in Sanya. Hu said during the summit, BRICS members -- Brazil, Russia, India, China and South Africa -- would exchange views on major issues concerning the global economy, finance and development. He believed the summit would be fruitful and help promote solidarity and cooperation among the five countries. During their meeting, Hu and Medvedev also exchanged views on issues concerning the Shanghai Cooperation Organization, tensions in west Asia and north Africa as well as the situation on the Korean Peninsula. They agreed to strengthen coordination to promote peace and stability in the regions concerned.